I could not sleep last night. I was thinking about that billboard. It was midnight and my emotions kept fluctuating between smiling to myself, and tearing up. Then I thought about last year’s benefit and then this year’s upcoming benefit. I thought about all of the work it has taken to become, and establish Life as a Zebra as a foundation. I thought about all of the people who have been there since the beginning…and the amazing ones I have met along the way. I thought about the team of people who have embraced and supported Life as a Zebra Foundation…Family, friends, and even strangers. 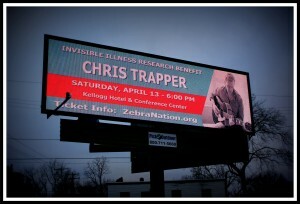 I thought about Chris Trapper, and how if any musician is deserving of having their name in lights, it is him. I thought about the ones who have never doubted Allie or me for a second and who have always been there asking, “What can I do?” “What do you need?” I thought about this website, and how writing and expressing myself has not only become a source of therapy, but has also become a source of support as I continue to connect with other incredible zebras. As I laid there, I came to the conclusion that the billboard is a symbol. A very fitting, BIG symbol. That billboard makes me cry because it makes me think about where we came from and where we are now. That billboard makes me smile because it represents a dream that continues to come true. I never thought that my aspirations of spreading invisible illness awareness would be lit up, written in huge letters for the whole city to see. I am proud to be a part of Zebra Nation. I am excited to continue our work on April 13, and into the future. I hope you join us, in person or in spirit.